Glyn Macey is a well-known artist, tutor and author who has spent many years experimenting in acrylics and encouraging others to do the same. We caught up with Glyn recently to ask about his new venture, Glyn Macey’s Acrylic Workshop, an online school for acrylic painters who want to liven up their style by trying some experimental techniques. Duncan Montgomery: The first question is quite simple; why did you choose to devote yourself purely to acrylics? Were you also excited by other drawing and painting media? Glyn Macey: I love to use and experiment with all media, and when I find something new it’s kind of like being a child again, learning from scratch; and I feel the same way about acrylics every day. For me, they’re the most versatile medium by far, and because my way of working is very exploratory, I am constantly finding new creative ways to work with acrylics. 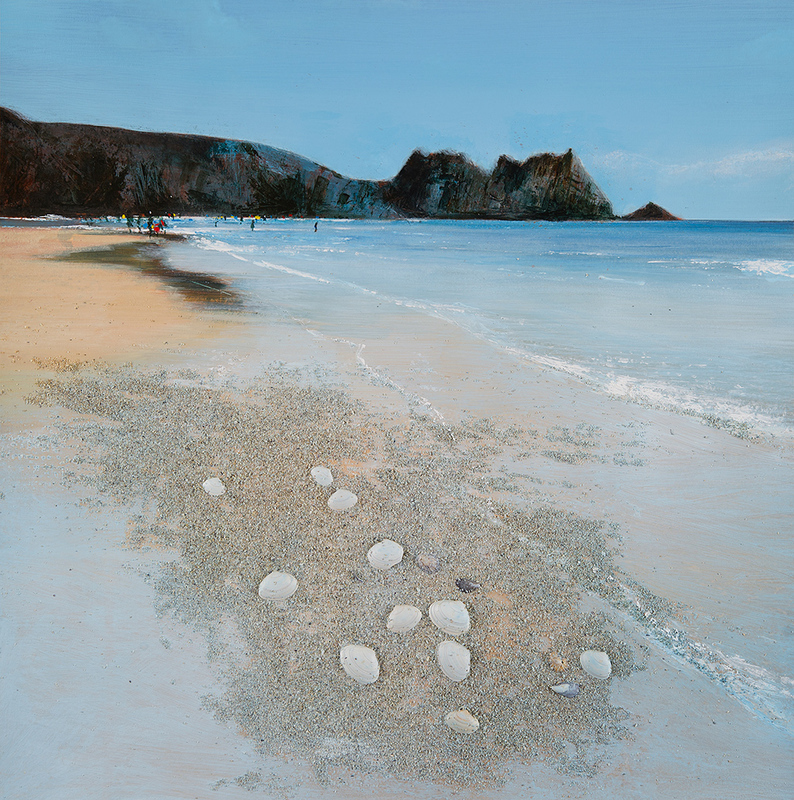 Glyn Macey, ‘Porthcurno’ (Acrylic and found materials; 24” x 24”). D: When did you start making acrylic tutorials, and how did your new online Acrylic Workshop come about? How has the site grown since you founded it? G: I have run creative workshops for years and have taught hundreds of artists my techniques and ways of working, so the online tutorials are a natural progression. I was very keen on the tutorials to be filmed and edited as close as possible to being at a live workshop, to try to capture that energy. I feel that we’re pretty close to that and the feedback that I get from subscribers is incredible, so we must be doing something right! 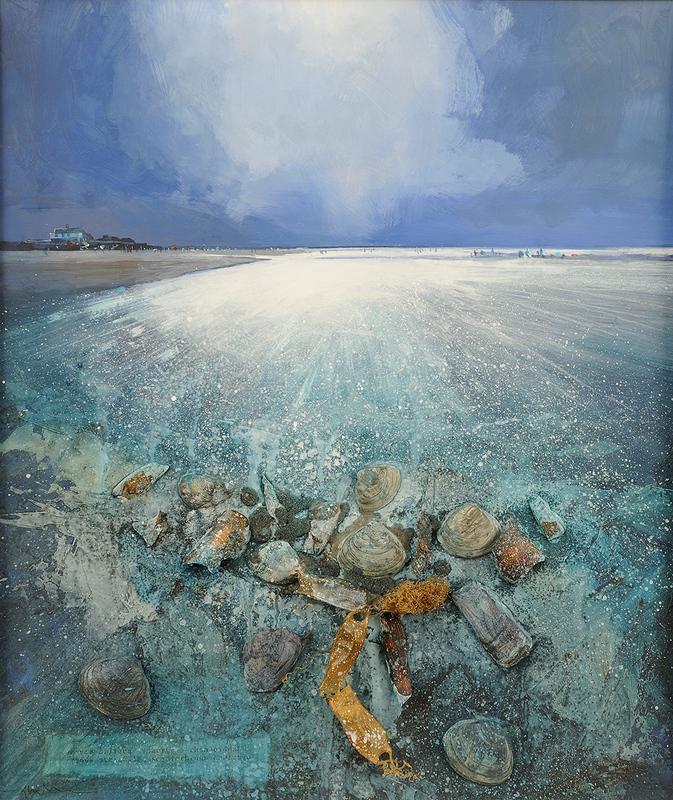 Glyn Macey, ‘Brancaster’ (Acrylic, ink and found materials; 30” x 24”). D: On one of your recent tutorials I noticed the rain was pouring down outside. Do you ever find it hard to motivate yourself on days when you can’t travel outside the studio? G: Ha! no, never! I love to work outdoors on location, but for me that doesn’t need to mean a Mediterranean blue sky and sun; painting in all weather conditions is what it’s all about, challenging yourself. I recently painted my way around the high Arctic, and that was a pretty challenging habitat with polar bears eyeing me up for lunch, but for me there is no better way to capture the atmosphere of a place than to experience it in all weathers, whether that’s rain, sun, freezing or hot. And as David Hockney once told me, “inspiration comes knocking at 9.15 every morning”. There’s no excuse to not start! 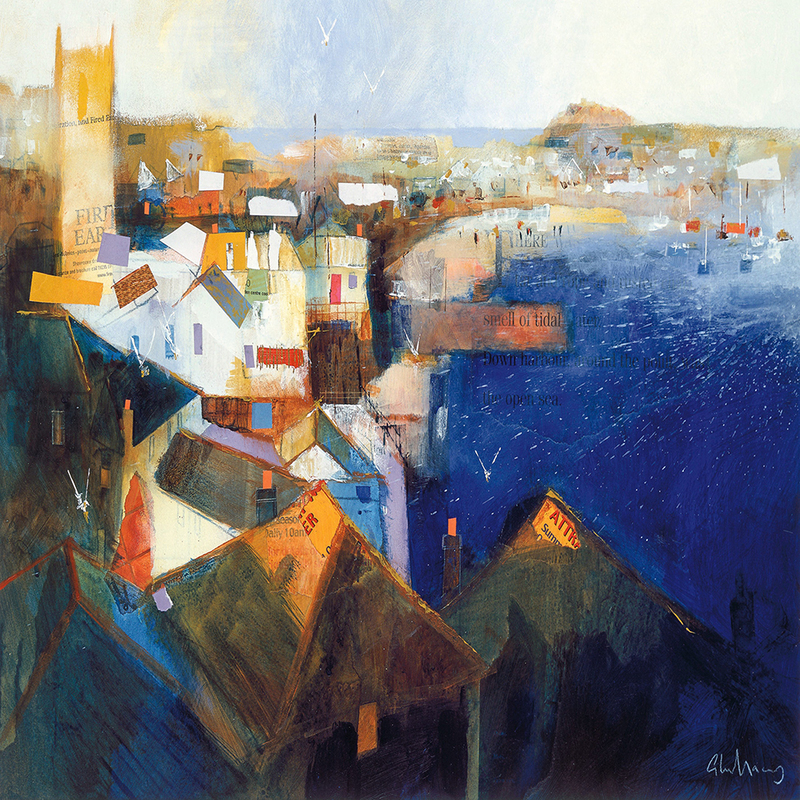 Glyn Macey, ‘Cornish Harbour’ (Acrylic, ink, pencil and collage; 24” x 24”). D: How do you balance your teaching with your other artistic projects and your own work? G: They really go hand in hand. For instance I’m currently running some ‘en plein air’ workshops painting out on the Cornish cliffs while also working on a project all about the ancient mining history of Cornwall so part of the teaching process becomes part of the project. I also learn as much from the students as they do from me, whether that’s images of work from the online tutorials being sent to me or from one to one discussion. I teach an experimental way of working which often leads to creative ‘accidents’ happening which can be fascinating and inspiring. You can find out more about Glyn Macey and his Acrylic Workshop on Glyn’s website. Glyn’s books ‘Glyn Macey’s World of Acrylics‘ and ‘Acrylics Unleashed‘ are both available from Jacksons. 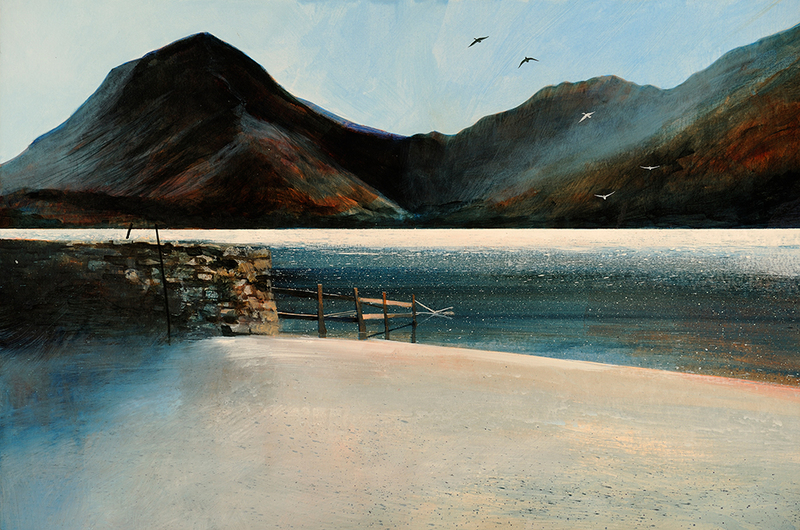 The image at the top of this article is Glyn’s painting ‘Buttermere’ (Acrylic, Pencil, Pastel, Ink; 24” x 18”).